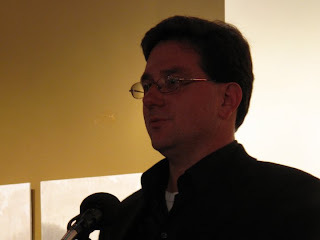 Super busy poet and poetry advocate, Scott Owens. So, Robert wrote to me with a simple request: write a 500-1,000 word personal story about a moment that helped guide my life or shape my worldview. Easy, right? No need to complicate things, just tell about the time I learned the meaning of love while holding my sick 4-month old daughter at 2:00 A.M.; or the moment my stepson burned himself and in caring for him I realized that I had overcome my own childhood abuse and was ready to fully embrace fatherhood; or the night I listened to my grandfather string stars together into his own constellations and recognized the power of creativity and self-determination; or the time when I was 8 and had to reach up inside a birthing cow and turn the calf so it could come out and realized none of us can do it alone. Easy, right? The problem is, all of the moments I could think of I have already written about in the form of poems, and telling those stories now as prose would seem somehow sacrosanct, a reductionist undoing. The poems, I hope, embody the tensions of those moments, recreate the epiphanies as if they were the readers as well as mine, retain the life of the moment in a combination of language, imagery, and association that might well be lost in the single-minded clarity of prose. At least that's how the poetry-lover in me thinks. As a teacher of poetry, I would never ask a student to retell the story of Galway Kinnell's "Little Sleep's Head Sprouting Hair in the Moonlight" in prose. I would, of course, invite them to write about the poem in prose, but not to try to prosaically recreate the moment of the poem by undoing, even negating the energy contained and conveyed through the poetic compression of the moment's perceptual, physical, cognitive, emotional, and spiritual experience. Nevertheless, I greatly appreciate the impetus behind Robert's request. In fact, I've been teaching workshops around the South for a couple of years now on techniques to access and organize such moments in our experience as potential subject matter for both poetry and prose. So, the last thing I would want to say to Robert on this request is "never mind." Instead, I'll do as poets tend to do anyway and complicate his request by giving him a couple of moments that match his criteria except that they're written not as prose but poetry. I hope they'll still work for his purposes and that they'll prove enjoyable and fruitful for his readers. rocks a little when I walk. all that I know, all I can learn. I can afford and more. and your body's frailty leave you unsure. And I will never let them take you, ever. my knee to any heaven's oppression. to save my life by saving yours. beneath her might not be real. of our two wrists as one. the lion, the great bear, the hunter's sword. how the stars made a woman’s face. we fear or long to remember. I see spider, sparrowhawk, bobwhite. the weight of it all. Finding and Longing For Community. Flying Solo: Traveling to London Alone. Enjoyed this very much Scott and Robert. Awesome poetry. Glad to find a new poet, and sent him a "friend request" on Facebook. His poetry is lovely. Glad to see you feature Scott. I love his poetry and collaborating with him was a time in my poetry life I'll never forget! An enjoyable read, Scott and Robert. Thanks. snScott, Thanks for staying faithful to the impulse of the lyric moment, "a moment in time drenched in emotion." This is the kind of poem humans can understand and can most easily relate to. Thanks for sharing. As a Scott Owens fan, I'm always glad to see more fans added! Beautiful moments captured, Scott. Just breathtaking, especially for those of us who are parents. I enjoyed meeting both of you, Scott and Robert, at the Blue Ridge Conference in Georgia in April 2011. I went to my motel room the first night, after the event where the three of us read, on a phenomenal high. Scott Owens had praised my prose. I even tried to dodge the praise, saying I was accustomed to nonfiction, but Scott wouldn't let me loose. It was my first time reading to an open group like that, and I told my husband, almost crying, that someone had really liked my fiction. Never got to really thank you. Fruitful indeed, Scott! Your poetry featured here evoked emotion from me. Really stunning work. Thank you, Robert, for this series and your work! Robert, this series is inspiring on so many levels. Today's post (Scott Owens, you are fabulous at what you do) nudged me right into my own notebook to work on new ideas. I'll come back to this page--more than once, I'm sure. Of curse, we know poetry and prose aren't interchangeable, but I'm so happy to see advocates for the notion that one needs to be deliberately encoded for an ordinary reader, while the other is meant to be clear. Thank you for the arrow of comprehension that pierces to directly from a poem to the heart of the reader.